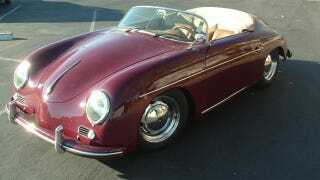 Currently for sale on Ebay, this Porsche replica has the body of a 356 Speedster and an electric heart. This electric Speedster is your chance to be green in style without leaving a long lasting impact on anything aside from your wallet. It isn't hard to understand why over 56 years after the Porsche 356 Speedster was introduced it remains one of the most beloved sports cars ever made. The classic lines, timeless style are and sheer simplicity of the Speedster is still as appealing today as when it was new. While the 356 Speedster was originally built as a stripped down and inexpensive alternative to a Porsche Cabriolet, their popularity and low production numbers (3,991) have made the cars very collectible and accordingly very expensive. Not long after the 356 Speedster started to be viewed as a collectible instead of old Porsches and priced accordingly, someone came up with the idea of building a replica 356 body and placing it on a Volkswagen frame. It seemed a natural fit in light of the fact early Porsches and the Volkswagens were very similar in design and construction. Producing replica 356 Speedsters has evolved into a fairly sizeable industry, with several companies offering do-it-yourself kits alongside turnkey vehicles built to order. Many of these kits are built with tube frames and hot rod Volkswagen engines and when well done, come as close to a vintage 356 Speedster as you can get without the six figure purchase price. What makes this Porsche replica different from your average, run of the mill, Speedster replica is revealed with one look under the round rear engine hatch. Taking up the space you might expect to be occupied by a modified flat four is an electric motor and a large lithium battery pack to power it. You read it that correctly; this burgundy Porsche replica is actually very green. This Speedster replica is offered for sale by a company that specializes in turning kit cars electric. The result is a vehicle that according to the seller "exceeds the original in almost every way". This electric Porsche matches the 11 second 0-60 time of the original Speedster and has a top speed of over 100 miles an hour. When the electric Speedster runs out of juice, it charges through an electrical outlet a dryer would use at a rate of 20 miles per hour. In the face of rising gas prices this Speedster would appear to be a stylish and environmentally friendly way to bypass the gas pump. Although the electric Speedster is unique and stylish, it hasn't managed to get around the two problems that plague electric cars: range and price. The range of the $35,000 electric Speedster as listed is 40 miles. With an optional $6500 battery pack the expected range doubles to 80 miles. While the idea is novel, we have a feeling most people are going to expect more than a 40 mile round trip potential out of their $40,000+ Porsche replica.